One of my major goals is to rear caterpillars from eggs in order to track their life histories – number of molts, sizes of head capsules, any variation in coloration or behavior. I am attempting to collect my own females to get eggs, so far with no luck. However my advisor has gotten some females to lay eggs for me, and I have a few batches on the way from other collectors. 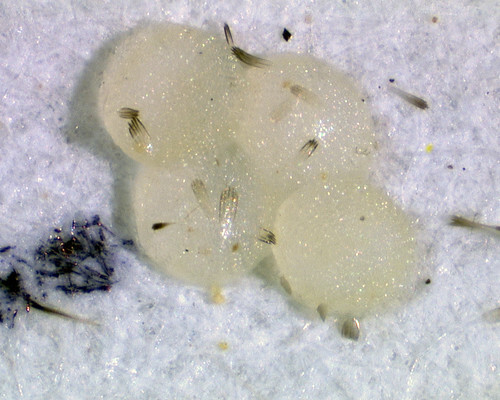 Here are the eggs of a relatively drab, unassuming little moth, Comachara cadburyi (Cadbury’s lichen moth). It is in the subfamily Acronictinae, and it is very rare for them to lay eggs in captivity. Out of a handful of females, only one laid for us, but wow did she do a great job. For a sense of scale, those are her own wing scales stuck to the eggs. The eggs were barely the size of an “o”, this image was taken through a scope with automontage software. And after about a week, they hatched into approximately 50 adorably tiny barely visible caterpillars. Now, there is a bit more of a story to this. I was away for the weekend, figuring not too much could happen in two days. Right? Wrong. All three of my egg lots (this species, and two others) hatched! My advisor was gone for a few more days, so I was thrown into a panic. I don’t know my trees very well yet, and the field guide gave so many options for each, I didn’t know what would be best to pick. Luckily, another student was working here, whose mother studies plants. I was able to follow them to their house to collect the three plants I needed… after much rushing around, I was finally able to transfer the larvae into new containers with food, and they happily settled in. Here are a few of the caterpillars, starting to feed on Nyssa sylvatica (black gum). This leaf was about 1″ long. 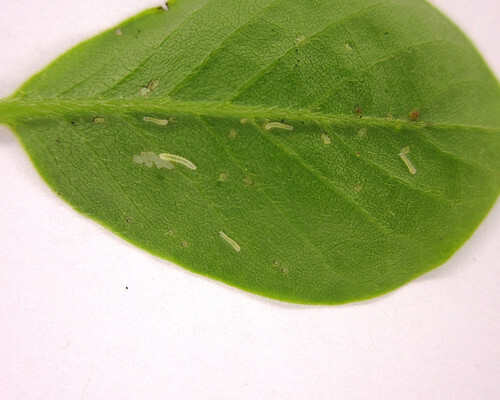 Notice the feeding damage – when caterpillars start out this small, they can only eat through one layer of the leaf, leaving little “windows”. They’re slowly growing and thriving, if I’m lucky I’ll get to rear them all the way through! Posted on May 26, 2011, in Comachara, Noctuidae. Bookmark the permalink. 2 Comments. We have a BlackGum with a load of leaf damage – “windows” in the leaves is a great description. Now we find what we think is the pupa stage all over the driveway. We can see the catepillars inside a flat scale-like shell. The damage is only on our Blackgum trees. Will these catepillars damage the trees permanently? How do we control the damage? Thank you.